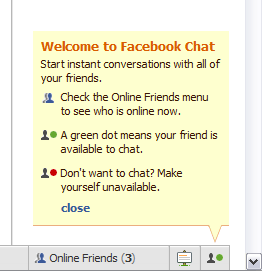 Facebook Chat is being rolled out. My personal feeling is that it’s going to prove very popular – quicker than walls, and, presumably, much easier to control privacy and who can see it. From that report, it seems that chat will be one to one, which could be a limiting factor, on the other hand it does mean that you can only chat to a friend, not a friend of a friend. In my view – it’s going to increase Facebook’s usage, probably quite lot.